Canada’s Best Play Equipment For Your Community—Now On Sale! You are here: Home / Latest News / News / Canada’s Best Play Equipment For Your Community—Now On Sale! For a limited time, save on the best playground equipment in Canada! We’re running a special promotion on our finest assortment of play structures and independent events. Now is your chance to create beautiful, fun play areas that delight your community—even if you are dealing with a limited budget. Give your children access to the developmentally appropriate and inclusive equipment they need. This offer is for Canadian playground buyers only, and runs only through June 30th, 2019. PlayPower Canada products are IPEMA certified to be compliant to CSA standards, meaning you can rest assured that you’ll be purchasing top-quality products that comply with the latest standards. Act now for great savings on Little Tikes Commercial and Miracle Recreation play equipment. 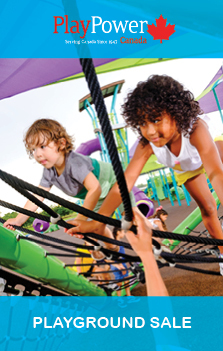 This sale includes both full play structures AND independent events. Request a free quote today! Click the catalogue above to see our sales flier. Like what you see? Contact a rep directly to get a quote!